visitors’ guest book and attended that product line demonstration. Alcorn from Ampex, where Bushnell had worked some years earlier. blinking and buzzing computer screen. In the 1980's the Manufacturer Midway/Bally produced a new game called pacman. It was different than any other game out there. Instead of shooting at things from a space ship, you were a cute animated character who collected fruit and gobbled up the ghosts chasing you. The object was to stay away from the Ghosts while eating all the Dots in the maze. after the distinctive theme music plays, players find themselves guiding 'puckman' around a single maze eating dots, while avoiding the four ghosts 'blinky', 'pinky', 'inky' and 'clyde' (each with varying levels of hunting skills), who escape from a cage in the middle of the screen and will end our little yellow friend's life if they touch him. in each corner of the square playfield is a large dot that when eaten will turn the ghosts blue for a brief period, during which time the tables turn and 'puck' can eat the ghosts, leaving only the apparently indigestible eyes which make their way back to the cage for reincarnation into another ghost. 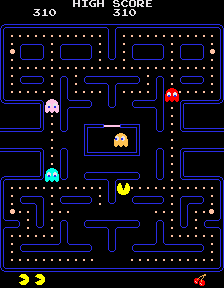 The game is deceptively simple, with only a four-position joystick needed to guide 'pac-man' around the maze, but with each successive screen the ghosts get faster and their time of blue-invulneribility less. Pac-man is a big hit in Japan. it's the first videogame to spawn a massive merchandising bonanza, with t-shirts, jackets, sweaters, coffee cups, stuffed dolls, bed sheets, cereal, board-games, books, towels... MS PAC-MAN The reason they made was to lure women into the arcade to play ms. Pac-man. her identity confirmed by the red bow and lipstick. The best players were able to group the ghosts which rendered them harmless. 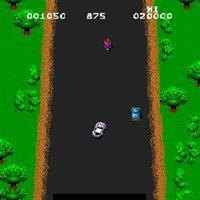 This game was very addictive because everyone wanted to get the high score. The best players had learned patterns which would put them in the higher levels were the ghosts became invensible. Book of World Records discontinued publishing High Scores after 1987.
working in prime condition. in 1982, America had more than 20,000 arcades. have just about completely disappeared.